Beginning on November 1st and operating through the end of March, the Home Energy Assistance Winter Crisis Program helps income-eligible Greater Cleveland residents that are threatened with disconnection, have been disconnected or have less than a 25 percent supply of bulk fuel in their tank maintain their utility service. This is a one-time benefit and is to be used in emergency situations when you are faced with disconnection. NEW THIS YEAR: The Council for Economic Opportunities in Greater Cleveland is implementing a new phone number and online scheduling option for clients utilizing our energy assistance programs. The new phone number, (216) 350-8008, goes live on September 1st. You can also make an appointment online through https://ceogc.itfrontdesk.com. YOU MUST HAVE AN APPOINTMENT TO RECEIVE ASSISTANCE. WE WILL NO LONGER ACCEPT WALK-INS. Please note that Crisis appointment holds will only be granted once per heating season to those who have not already taken advantage of the Winter Reconnect Order before scheduling. If you pay the $175.00 to a utility or split payment to both utility companies, they will not get another hold on their account by making a crisis appointment. Any household whose total income is at or below 175% of the 2018 Federal Poverty Guidelines may be eligible. NEW THIS YEAR: income requirements have changed! OCA now requires 30 days or 12 months of income to qualify for HEAP, Summer and Winter Crisis and PIPP Plus. All seasonal and self-employed applicants must provide 12 months of income. The program operates each weekday beginning at 8:00 a.m. at the NEW HEAP Office located at 2203 Superior Ave. in Cleveland. Please call (216) 350-8008 or visit https://ceogc.itfrontdesk.com to make an appointment. In order to apply for emergency energy assistance, a resident must have the most recent bills for gas and electric utilities, proof of U.S. residency, photo identification, Social Security numbers for all household members and verification of all income for all household members eighteen years or older for the previous 30 days or 12 months. Permanently and Totally disabled customers must provide proof of disability. For those households who have no income, an IRS Tax Transcript is required. Self-employed applicants must provide an IRS transcript and/or 1040 including all schedules. Renters living in multi-unit dwellings may be required to provide their landlord’s name and contact information. The PIPP Plus Program is a long-term solution to maintaining home energy services. The program helps eligible households maintain gas and electric services throughout the year by paying the utility company a percentage of their household income. The program makes energy bills affordable year-round and if the monthly payments are made on-time and in-full, overages and the rest of the month’s bills are forgiven. You must call (216) 350-8008 to make an appointment. July and August are two of the hottest months of the year in Ohio, especially for senior citizens or those with serious medical conditions. The Council will help income-eligible Cuyahoga County residents with payment of an electric bill or the purchase of a fan/air conditioning unit to help ease the burden caused by summer heat. This program has ended for the 2018 year. It will resume in 2019. YOU MUST HAVE AN APPOINTMENT TO RECEIVE ASSISTANCE. WE WILL NO LONGER ACCEPT WALK INS. Appointments are available Monday through Friday from 8:00 a.m. until 4:00 p.m. The program operates each week day at the NEW HEAP Office located at 2203 Superior Ave. in Cleveland. 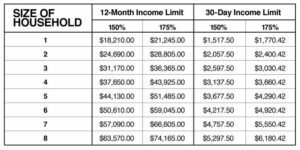 NEW THIS YEAR: income requirements have changed! OCA now requires 30 days or 12 months of income to qualify for HEAP, Summer and Winter Crisis and PIPP Plus. All seasonal and self employed applicants must provide 12 months of income. This program provides a benefit once per cooling season to Cuyahoga County residents who are at or below 175% of the Federal Povery Guidelines, have a household member age 60 or older and/or a household member with a documented medical condition requiring air conditioning. In partnership with First Energy the Council offers another solution to assist with utility bill payments for the customers of the Cleveland Electric Illuminating Company, Ohio Edison, and Toledo Edison. The Fuel Fund program provides up to a $300 maximum annual benefit to households for home utility bill assistance. In order to be eligible, a household cannot have participated in the program within the past year and must have paid their electric bill at least once in the prior three months. The Fuel Fund program serves residents in Cuyahoga, Ashtabula, Lake, Lorain and Geauga counties.